C. F. Martin OM-28 Custom Model Flat Top Acoustic Guitar (1990), made in Nazareth, PA, serial # 493834, natural lacquer finish, Brazilian rosewood back, sides and neck, Engleman spruce top; ebony fingerboard, original black hard shell case. Sometimes we do see older custom-made C. F. Martin guitars, but rarely does one as fine, clean, and well-documented as this turn up. It comes directly from the family of the customer who originally ordered this one-of-a-kind guitar in early 1990 to be built by Martin's Custom Shop, through the Music Emporium in Boston. The instrument is a close re-creation of an early 1930s style "Orchestra Model" OM-28, using the finest materials available at the time. The original hand-filled-in Custom Shop order sheet is still with the guitar and lists the features in exacting detail. The top is close grain AAAV Engelmann spruce, the back and sides figured Brazilian rosewood, as is the headplate. Other details specified include 5/16" top braces, vintage style herringbone top trim and zipper back strip, "LP" Low Profile neck with adjustable truss rod, ebony fingerboard and bridge with slotted diamond inlay, 1 3/4" nut width, 25.4" scale, 2 5/16" string spacing, gloss finish on the body with no ageing toner, satin finish on the neck, enclosed M-6 tuners with small buttons, and a small "teardrop" 1930 OM style tortoise pickguard. As can be seen, this guitar is designed as a close but not exact vintage 1930 OM re-creation. The smaller Grover-style openback tuners currently used on most reproduction 1930s guitars were not available at the time, and nobody wanted banjo tuners! The adjustable truss rod is another "modern" feature that makes the guitar more functional without compromising its sound or feel. The instrument is extremely well-thought out and represents a unique "Vintage/Modern OM" combination; an exceptionally fine player's guitar. This is really something Martin should have offered as a stock model, even if Brazilian rosewood was not feasible to use in quantity. As it is Brazilian rosewood, Martins from this era are quite scarce, and now this guitar could not be made at all except at great expense from old-stock wood, due to the extreme limitations on Brazilian rosewood use. Even with little play time evident, the sound is rich, articulate, and highly detailed, typical of the best OM style Martins. The wider neck is very comfortable, and especially makes for a wonderful fingerpicker, although it is a powerful "strummer" as well. This unique and exceptional guitar is in immaculately well-preserved condition, still waiting to be fully enjoyed! Overall length is 40 in. (101.6 cm. ), 15 1/16 in. (38.3 cm.) wide at lower bout, and 4 1/8 in. (10.5 cm.) in depth at side, taken at the end block. Scale length is 25 5/16 in. (643 mm.). Width of nut is 1 3/4 in. (44 mm.). Aside from a couple of small pick scratches above the sound hole, this guitar presents as virtually near mint and looks to have been very little played -- the frets and fingerboard show virtually no wear. It's a bit sad, actually, as this is really a wonderful playing and sounding guitar, both rich and incisive and very versatile as well. It has already matured for almost 30 years; with some serious play time we can only imagine how the sound will open up even more. 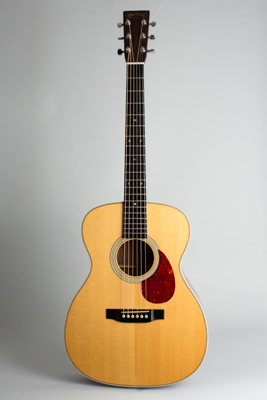 One of the nicest Martins from this era we have ever seen, complete in the original molded plastic hard case with the hand-filled-out custom order sheet it was built from and the period "Care and Feeding" booklet. Excellent + Condition.